Amarin share prices nearly quadruple after the biopharmaceutical company's fish oil capsule showed dramatic benefits to heart patients in a clinical trial. Amarin says its capsule, Vascepa, significantly reduced the risk serious cardiovascular events over a placebo in a trial of 8,179 statin-treated adults with elevated cardiovascular risk. 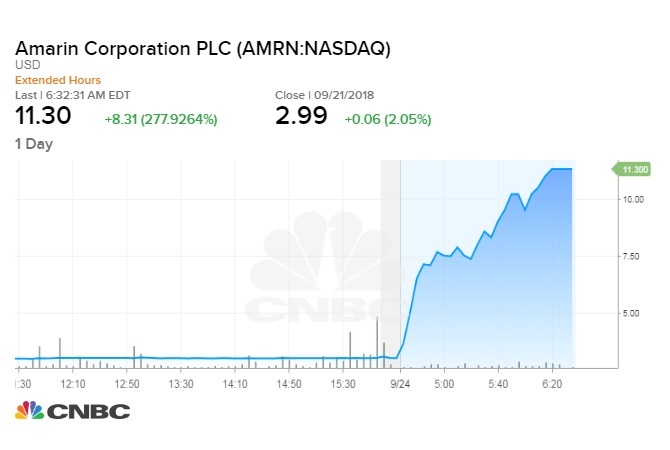 Amarin shares surged Monday after the biopharmaceutical company's fish oil capsule showed dramatic benefits to heart patients in a clinical trial. Amarin said the capsule, Vascepa, significantly reduced the risk of serious cardiovascular events over a placebo in trial results involving 8,179 statin-treated adults with elevated cardiovascular risk. "We are delighted with these topline study results," John Thero, president and CEO of Amarin, said in a press release. The company said the trial met the primary endpoint with a 25 percent risk reduction. Shares of Amarin closed 314 percent higher on Monday, at $12.40 a share. Thero told CNBC the drug isn't meant to replace statins or PCSK9 inhibitors, which lower cardio risk by about 25 to 35 percent. Instead, Vascepa focuses on reducing the remaining 65 to 75 percent residual risk. The drug is already used by patients with high triglycerides and a risk of pancreatitis, but the company is now building up its supply and "significantly" expanding its sales force, Thero said on "Power Lunch." "We've got five years of successful commercial production, so we've shown that we can do it. We've got good relationships with physicians. We already have broad managed-care coverage and most patients can get the drug today for its current indication for about $3 per month with commercial insurance," he said. Thero also said the company doesn't expect to necessarily raise the price, which is currently $2,400 a year. Right now, Vascepa is priced at a level comparable to statins before generics became available. "We are the first in a very new market and we're trying to have our drug be used by millions of patients, which means it should be affordable," he said. The stock closed at $2.99 on Friday. Amarin was down more than 25 percent this year through Friday's close. After Amarin released the results, SunTrust Robinson Humphrey reiterated its buy rating and raised its price target on the company to $15 from $6, citing increased commercial opportunity for the capsule. Amarin will present the results at the 2018 Scientific Sessions of the American Heart Association in November.